History pervades everything. If you’ve ever gone on a hike in the woods and unexpectedly discovered the remains of a crumbling barn, the shards of a glass bottle, or the fading traces of an abandoned path, you’ve seen this for yourself. So often, however, this fact is overlooked by our culture in its persistent race toward novelty, which is frequently presented as an unqualified good but should more accurately be considered a drug to distract us from what is truly important in life. Regardless of whether it functions as a sedative or stimulant, novelty is frequently nothing more than a relic of the past redecorated for modern consumption. The irony of this situation is that confronting the complexity of the past in all its historical depth can provide a greater sense of novelty than any prefabricated commodity on the market. By going into the world, seeing for ourselves the impact of the past on the present, and extrapolating from the present to the future, we can begin to appreciate where we as a species have been and where we are rapidly heading. We can also begin to appreciate how much our own lives are deeply and inextricably interwoven with the lives of people whose last footstep came to rest on this planet centuries ago. Not for the first time, I found myself in this position on the first weekend of May, when I took a hike on an unfamiliar stretch of trail at Eno River State Park. I’ve hiked portions of the Laurel Bluffs Trail in the past (click here to view story), but the trail is so long and hilly that I’ve only ever been able to traverse a small portion of it at a time. 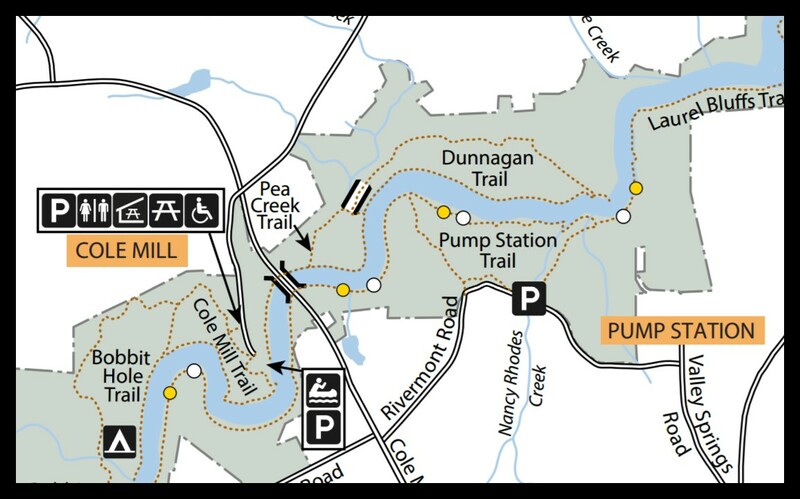 In this instance, I started from the Pump Station Access on Rivermont Road in Durham and made my way northwest to the southern bank of the Eno River, where I then followed Laurel Bluffs Trail on its southwest trajectory toward the ruins of McCown’s Mill. Laurel Bluffs Trail is one of the less frequented and consequently less well maintained trails in Eno River State Park. As such it can be somewhat treacherous in parts, especially when the trail suddenly veers up a steep incline or skirts the edge of an actual bluff. Nonetheless it’s also deeply peaceful by virtue of its seclusion and at times hypnotically beautiful in its serpentine dance along the banks of the Eno River. On this occasion in early May, as I navigated through the woods on Laurel Bluffs Trail, I was keenly aware of this. I was also aware of the presence of the ruins of an old mill – which was originally called McCown’s Mill and later called Cole’s Mill – on this stretch of the Laurel Bluffs Trail. In fact there’s a nearby road in Durham named Cole Mill Road, which to this day passes within a quarter mile of McCown’s Mill and was presumably named for its close proximity to the mill after it underwent a change of ownership in 1874. Though most people have no idea of the origin of the name of the road, it’s one small but pervasive way in which history has left its mark on the land. The mark would never have been made, however, without the work of many people who lived in this area and ensured the construction of McCown’s Mill over two centuries ago. Foremost among these people was John Cabe, the owner of another mill a couple miles upstream, whose family was one of the most powerful and influential in Durham during the eighteenth and nineteenth centuries. Fulfilling his responsibilities as patriarch, John Cabe oversaw the construction of McCown’s Mill in 1813 as a kind of dowry for his daughter Rachel Cabe upon her marriage to Moses McCown. The reason for this was simple. John Cabe had nine daughters and no sons, and during this period in US history women were prohibited from owning or inheriting land in their own name. If they were in a position to own or inherit land, it transferred to their husbands by default. This situation did not change in North Carolina until 1868, when married women were finally allowed to own property in their own name in the event that their husbands were irresponsible, imprisoned, or incapacitated. Therefore, if John Cabe wanted to continue to exercise power and influence over the region, he had to find some way to ingratiate himself to the man who would become Rachel Cabe’s husband and the legal owner of his lands. This John Cabe did by financing the construction of a mill and naming it after his son-in-law, Moses McCown. This marked the beginning of McCown’s Mill, one of the more substantial mills in the region as indicated by the presence of a tilt hammer. A tilt hammer is a very large and powerful blunt instrument used primarily in smithing to refine ore and temper steel; this made it very handy in the time before steel mills were common in the United States. Below is a short video demonstrating a tilt hammer (also called a trip hammer) in action. It represented a significant input of capital on the part of the mill owner and allowed the mill to perform a much wider range of operations than it would otherwise have been able to. In a sense, it was John Cabe’s way of making sure that Moses McCown fully appreciated how much he owed the older man. But the marriage between Moses McCown and Rachel Cabe was not to last. In 1830, Moses McCown died, leaving Rachel the implicit but unrecognized owner of McCown’s Mill. To ensure that her children would inherit the mill uncontested, Rachel married another mill owner named Herbert Sims in 1831. Rachel’s family subsequently held the mill until 1874, when Rachel’s children sold the mill to John Anderson Cole. It was at this time that McCown’s Mill became Cole’s Mill. In 1908, however, the mill was destroyed in a devastating flood, after which time McCown’s Mill became little more than a footnote in history. Aware of the presence of the old mill, I was keen to find as many traces of it as I could on my hike. After crossing under the overpass for Cole Mill Road, which is still functional to this day, I passed through the surrounding forest of beech and sycamore, noticed the leveling out of the trail on the flood plain, and finally caught sight of something ahead. There was a footbridge over a small creek, and I hurried to cross it. After the footbridge, I noticed a side trail branching to the left away from Laurel Bluffs Trail. Peering into the distance, I caught sight of something that appeared to be an old stone hut. Intrigued by the thought of what it might be, I approached through the thicket of undergrowth, which wasn’t as well cleared now that I was off the main trail. When I came within ten feet of it, I stopped in my tracks and admired the handiwork which graced the old springhouse. This was the location where meat, dairy, and perishables would have been kept cool in the late eighteenth and early nineteenth centuries, before the advent of icehouses or refrigeration. Returning to Laurel Bluffs Trail, I resumed my search for the ruins of the old mill. Before long, I noticed a cylindrical depression in the ground to my left, about twelve feet wide by five feet deep with sloping edges. Then something, actually two somethings, caught my eye. They were sitting on the southest side of the depression, opposite where I was standing. They were about four feet in diameter and were draped in undergrowth. They were undoubtedly millstones. The first millstone I saw was the runner stone, which sits on top and rotates in a traditional gristmill. In this position it provides the necessary force to create friction to grind the grains which are fed into it from above. The circular hole in the middle facilitates the motion of the stone spindle, an axle which attaches to the runner stone and causes it to rotate. The second millstone I saw was the bed stone, which sits on the bottom of a traditional gristmill. In this position it remains stationary while providing the counterforce necessary to create friction to grind the grains which fall between it and the runner stone. If you look closely, you can see the fissures where separate stones were plastered together to form the bed stone. Continuing down Laurel Bluffs Trail, I came to a hill where another side trail branched to my left. Taking this trail, I ascended the hill by the side of a creek bed and came to an old abandoned cabin, surrounded by foliage and adjacent to a field. There was no clear indication of what purpose this cabin served, but it may have been associated with one of the ancillary businesses frequently attached to a mill: forge, general store, cotton gin, or distillery. Turning west, I continued to explore the hillside. Before long I came to a clearing, after which I was able to discern the unmistakable traces of an old road stretching into the distance. To the south of this road, there was a primitive stone wall that stood about two feet high, though it may have been much taller when the mill was still operational. Positioned on the edge of the road that passed by the mill, the wall may have formed an enclosure for a loading dock where materials from McCown’s Mill were transferred onto awaiting vehicles for transport to distant markets. Backtracking to the cabin and descending the hill, I started hiking Laurel Bluffs Trail back to the Pump Station and my car. The trail was mostly deserted, but the views were pleasant and gave a distinct impression of what must have attracted so many early European settlers to this area in the seventeenth and eighteenth centuries. Certainly the beauty of the area must have been one of many reasons why John Cabe and his daughter Rachel chose to make a home for themselves on the banks of the Eno. For my part, the beauty of the Eno Valley has been a great benefit to me over the past two years since I started hiking regularly. But there’s so much more than mere beauty to be found here and in any other wilderness. There’s a haven of peace and tranquility, a hotspot for health and fitness, and a great place for outdoor recreation. Beyond that, there’s a vital connection to the past in the form of historic sites such as McCown’s Mill, without which future generations will have no way to fully appreciate the importance of a crucial chapter in local history. There are other additional reasons for the preservation of historic sites. For a start, they prompt us to reconsider what is truly important in life: freedom, nature, beauty, peace, health, and belonging. They beg the question of why our culture is so obsessed with and addicted to novelty for its own sake. They allow people to develop a real relationship with the land, without which our lives would not be possible. They reveal that history and the land are one, so deeply intertwined that it takes only the smallest scratching at the surface to uncover a wealth of knowledge about both. Finally they show that if our species is to survive on this planet, we must protect both history and the land. Without them not only will we starve, but we will even forget who we are. Anderson, Jean, “A Community of Men and Mills,” Eno Journal (via Eno River Association), Vol. 7 Special Issue, July 1978, accessed April 30th, 2018. Anderson, Jean, “Cabe, John,” Dictionary of North Carolina Biography (via NCpedia), (University of North Carolina Press, 1976), accessed May 3rd, 2018. Anderson, Jean and Margaret Nygard, “The Story of West Point on the Eno,” Eno Journal (via Eno River Association), Vol. 3:1, 1975, accessed May 2nd, 2018. Bender, Nancy, “Spring Houses, Important Buildings in the Past,” Mercersburg Historical Society, accessed May 1st, 2018. “Cabe, John Family Cemetery,” Durham-Orange Genealogical Society (via Cemetery Census), accessed May 3rd, 2018. “February – McCown-Cole Mill,” Eno River Association, accessed April 30th, 2018. Heron, Duncan, “Mill Sites on the Eno River; A Geological Viewpoint,” Eno Journal (via Eno River Association), Vol. 7 Special Issue, July 1978, accessed April 30th, 2018. Khan, B. Zorina, The Democratization of Invention: Patents and Copyrights in American Economic Development, 1790-1920 (New York, NY, USA: Cambridge University Press, 2005) pp. 166-8. Kueber, Gary, “McCown-Cole-Sparger-Nygard House,” Open Durham, accessed May 2nd, 2018. Nygard, Margaret, “the Coles,” January 1986 Calendar, Eno River Association, accessed May 10th 2018. “Trip Hammer,” Wikipedia, accessed April 30th, 2018. Spring came early this year in central North Carolina and brought with it exceptionally warm temperatures, arriving by the middle of February after a winter that was exceptionally cold and snowy. The pairing of exceptional warmth with exceptional cold may seem unusual, but it’s more easily understood if you think of it as a climatic fever. When you have a fever, your temperature is elevated, yet your body experiences chills as it attempts to fight off infection. This is precisely the situation in which our planet finds itself, attempting to deflect the worst ravages of industrial extraction by hobbling the climate on which industry depends for ease of extraction and transportation. In the process, however, there are numerous side-effects which most media outlets conveniently blame on the natural world rather than the extractive industries which are truly responsible for destabilizing the climate. This pattern of climatic destabilization – which includes the undermining of established patterns of temperature and precipitation globally – is an increasingly common phenomenon throughout our world and represents another aspect of climate change. Though most people are hesitant to speak the truth on this matter, the fact remains. What we’re seeing isn’t merely a momentary aberration; it’s the transition to a new and highly inhospitable global climate, in which our world will be irrevocably altered for the worst, whether we like it or not. At Occoneechee Mountain, this climatic transition was more subdued on my first visit of 2018 than it was in 2017. In 2017, there were flowering plants of every stripe putting forth new growth by January. When I visited Occoneechee Mountain in February of this year on the other hand, there were comparatively few flowering plants in bloom. There were some, however, and there were other signs of spring to be found as well, despite the fact that spring in central North Carolina doesn’t typically arrive until the beginning of April at the earliest. When I arrived at Occoneechee Mountain on the last Sunday of February, the clouds were overcast and gloomy, telling of the torrential and unseasonable rainstorms that have recently become common in central North Carolina during the winter months. The land was still drenched from the latest rainstorm, and with temperatures in the 60s it felt more like April than February. I got out of my car, started hiking the Mountain Loop Trail, and tried to keep solid footing on ground that might as well have been the last remains of a mud pit. Aware of the mud and careful of my footing as a result, I crossed the north and west sides of Occoneechee Mountain without difficulty. The deciduous trees were still mostly bare, though buds were starting to appear on many of the maples and dogwoods. The pines were stately and serene, lending the lion’s share of green that could be seen on most stretches of the trail. There were, however, other patches of green here and there. As I progressed down the trail, those patches became more prevalent on the forest floor, and it wasn’t long before I decided to stop in my tracks and take a closer look. What I found when I took a closer look was a strikingly beautiful yellow and red flower that loosely resembled a columbine and had unmistakably distinctive maroon leaves with green spots flecked across the surface. I was baffled as to the identity of the flower, since I’ve never seen it at Occoneechee Mountain in years past and have certainly never seen it in a domestic garden. At a later date I was able to identify it as a yellow trout lily (Erythronium americanum), which I learned through a bit of research has a tendency to remain dormant for most of the year, thereby explaining why I had never noticed it before. There are in fact only about ten weeks of the year when the plant is active, during which time each individual yellow trout lily will produce either one leaf with no flower or two leaves with one flower. Though there are reputedly only about five percent of plants with flowers in any yellow trout lily colony at a time, the profusion of tiny yellow and red flowers at my feet left me wondering if there was a single square inch of the forest floor where these plants weren’t already residing. Walking past the largest profusion of yellow trout lilies along the north side of Occoneechee Mountain where it skirts the Eno River, I noticed faint ruins of a mill race that used to adjoin the Quarry. The ruins of the mill race followed the course of the trail at this point, and it was only after walking north of the trail and looking back that I was able to discern a better view. The presence of the mill race was more readily visible on this visit because of the vibrant green moss blanketing the ruins, which seemed to have greater intensity of color after the latest rainstorms. As I passed from the ruins of the mill race up the side of the mountain toward the Overlook, I decided to stop and admire the view. Though it was marred by the clearcut of an electric line extending to the north and south, it was refreshing to see so much land that’s still in a reasonably natural state. The fact that Occoneechee Mountain is directly adjacent to downtown Hillsborough, North Carolina, is one of the park’s biggest assets, since the town of Hillsborough is generally vigilant in its preservation of historic sites – of which Occoneechee Mountain is one of the foremost. However being in close proximity to a town that’s expanding in population and housing brings with it the imminent risk that much of the surrounding terrain will be significantly degraded and will cause harm to the mountain by extension. As a result my feelings are increasingly ambivalent when I look in the distance from Occoneechee Mountain. Regardless of any ambivalence about housing, I love the views and the land itself, and it wasn’t long before I was hiking the last stretch of Mountain Loop Trail in quest of the amazing view from the Overlook. When I reached the crossing of Mountain Loop Trail and Overlook Trail, I switched from the former to the latter and continued the last portion of my ascent before coming into view of the fenced-in area at the edge of the old Quarry that provides the most memorable view in the whole of the park. The clouds were still overcast and were threatening to downpour at any moment; similarly I was drenched from my own perspiration as a result of hiking in such warm springlike temperatures. None of that mattered, however, when I reached the edge of the Overlook and the high point of my hike. After taking time to relish the view from the Overlook, I returned to the trail and descended Occoneechee Mountain. The forest surrounded me on all sides again, and it was easy to forget that an expanding town and a major interstate were both less than a mile away from my location. I passed the lone house in the park, where the park ranger lives, and reached the last stretch of trail before the parking lot. As I came into view of the parking lot, I noticed one other telltale sign of spring: a bradford pear (Pyrus calleryana) in full bloom. These trees are frequently the first to indicate the arrival of spring, and this one in particular left no doubt in my mind about how quickly the world around us is being irrevocably altered in front of our very eyes, whether we like it or not. Winter isn’t typically considered the ideal time to go for a hike. Most people dislike the cold, snow, and limited hours of daylight–which can be daunting. But there are also perks to hiking in winter: 1) there’s greater visibility in a deciduous forest due to the absence of leaves, 2) there’s added photographic appeal because snow will provide accentuation to the contours of the land, and 3) there are fewer difficulties with parking due to the general preoccupation with indoor activities at this time of year. So, in short, there are good reasons to look for a park in your area even when the thermometer is dipping below freezing. The perks of winter hiking were recently made clear to me when I took the Cabe Lands Trail at Eno River State Park in Durham, North Carolina. If you’ve read this blog for any length of time, you know this park is one of my favorite hiking destinations, with so much acreage and so many trails that I still haven’t covered all of them in the year and a half I’ve been hiking there on a monthly basis. The Cabe Lands Trail was one of those unexplored areas–though I covered some of it in June of last year on another hike (full story here)–and so on the third weekend of December I decided to remedy the situation by hiking the remainder of it for the first time. I arrived at the Cabe Lands Access in late afternoon on Sunday, and there were only two cars in the parking lot. This is amazing because in summertime parking space for the Cabe Lands is virtually nonexistent, as I discovered when I hiked part of it last year. In winter you’d be forgiven for thinking this isn’t even the same trail simply on the basis of the lack of crowds, which so thoroughly characterize the area near the Eno River Rock Quarry in summertime, when the appeal of cool water on a hot day is tantalizing. Getting out of my car, I was greeted by the cold but fresh air, which immediately invigorated me. 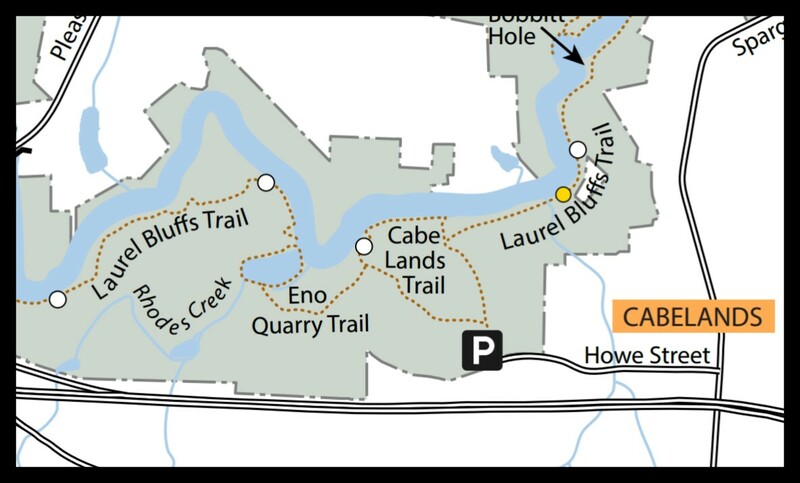 Starting on the Cabe Lands Trail, I took the western fork when I reached the junction with Eno Quarry Trail, and from there I headed toward the quarry itself. My plan was to circle the quarry, return to the junction, then resume the Cabe Lands Trail for the remainder of its length, going in a clockwise direction. After traipsing through a forest of pine, oak and beech–which allowed greater visibility due to the lack of leaves, providing a gorgeous view that extended for miles into the distance at some points–I reached a beautiful creek that marks the edge of the land bordering the quarry. The water in the creek was so pure and clear, I was almost tempted to take a sip. Instead I took several photos, including the following. Crossing the little creek, I reached the Eno River Rock Quarry itself. The difference between summer and winter was absolutely striking. Whereas the entire area surrounding the quarry had been full of splashes, laughter, conversation, and flirtation when I visited in June, there was now stillness, peace, calm, and tranquility of an almost preternatural depth. In the absence of human activity, the quarry was something out of a dream, reclining lazily in the embrace of the forest and waiting patiently for someone to come and appreciate its beauty. Of the three other people I saw during my hike on this day, two of those people were at the quarry, some distance ahead of me on the trail that snakes around the body of water. They appeared to be father and daughter, and the pensive silence between them reflected the silence of the water around them. Something about the way they walked, with heads bowed and voices hushed, conveyed a sense of reverence that was entirely appropriate at this site where at least two people have drowned over the past fifteen years. Though I didn’t ask them, I did wonder if they were family members of one of the two young men who never returned from the murky waters of the Eno River Rock Quarry. Passing around the western edge of the quarry, I came to the spot where divers congregate to make flying leaps into the sixty-foot waters in summertime. The place was utterly transformed, so calm and quiet that the call of a house wren would’ve reverberated across the waters with the audacity of a freight train. Despite the ideal acoustics, I was too enamored with the reverential silence of the area to do anything but proceed with hushed footsteps. After finishing my circuit of the Eno River Rock Quarry, I returned by the way I came, arriving soon thereafter at the junction where I had originally diverged from Cabe Lands Trail. Taking a left at the junction, I noticed that the trail started to descend rapidly, taking me from the height of Laurel Ridge to the south bank of the Eno River in about five minutes. The trail was exceptionally rocky and strewn with river pebbles, highlighting the fact that this portion of the Eno was once adjacent to a working mill, which had extensive earthworks and employed stone from the banks of the river in its construction. Before reaching the ruins of Cabe Mill, however, I noticed a ford in the Eno where rocks provided an ideal vantage point to take a photo of the river on its eastward course. Balancing tenuously on stones as the frigid water gurgled under my feet, I marveled at the sight in front of me. It was easily one of the best views of the Eno that I’ve seen in a long time, ranking among my top three views of an exceptionally photogenic river in an exceptionally photogenic park. After satisfying my photographic impulse, I returned to the bank in time to notice the third and final person who crossed my path on this hike. He had a small dog running ahead of him and quickly stooped to leash her before getting close–which was probably a good thing judging from her apparent lack of socialization. Passing the man and his dog, I finally started to notice definite features of an abandoned mill, including deep rivets in the ground and partial stone embankments, which formed millraces long ago. I had to go some way off the trail to get a better view, but it didn’t take long before the ruins of Cabe Mill came into view. As always, I was fascinated by the stonework, so intricate and well-made that a significant portion of it continues to stand after two centuries. In my research regarding the history of the site, I wasn’t able to find out the exact date of the mill’s construction. But if Cabe Mill is contemporaneous with Holden Mill, another historic site at Eno River State Park, then it was built in the early nineteenth century. The Cabe family–who owned the mill and lived nearby–settled in this area in 1758, when Barnaby Cabe immigrated to North Carolina from Britain. He was Presbyterian and as a result had a high estimation of the value of education, which prompted him to fund the construction of a schoolhouse nearby. The real handiwork of the Cabe Family, however, was the mill which bore their name, the ruins of which were standing in front of me in the middle of the woods by the Eno River. Realizing the light was waning and the day fast approaching an end, I left the ruins of Cabe Mill and started my ascent from the south bank of the Eno through Cabe’s Gorge on my way toward the parking lot. I tried to envision what the area must have looked like two centuries ago, when so much of the land surrounding the Eno River was heavily industrialized and much more densely populated. It would’ve been virtually unrecognizable, in addition to being much more dirty and polluted than it is now. Though it’s easy to take for granted a place like Eno River State Park–which receives very little public funding from the state of North Carolina and stands in a position of increasing economic precarity due to budgetary shortfalls–it’s worth remembering that without this park the area surrounding it would very quickly be turned into a wasteland, where the beauty of a winter hike in the woods would be nothing more than the memory of a bygone era. Anderson, Jean Bradley, “The History of Fews Ford,” Eno Journal, Vol. 8:1 via Eno River Association, accessed January 2nd, 2018. “Cabe Lands Trail,” North Carolina State Parks, accessed January 2nd, 2018. “Cabe Lands Trail,” Hiking Project, accessed January 2nd, 2018. At the beginning of October, I took my first hike around one of the most remarkable and historic locations in Durham, North Carolina. I had no idea before visiting exactly what I would find, and I very nearly missed my hike because of the virtually nonexistent parking–which consists of a few spots on the side of a gravel road running through what appears to be the middle of nowhere. Despite the abysmal parking, the land surrounding the Pump Station Trail at Eno River State Park–which crisscrosses the old dam for the City of Durham–is a testament to the power of water and its crucial role in society. It’s also the perfect place for an adventure you’ll never forget. After parking along the side of the road, I got out and started looking for the trail itself. It wasn’t readily apparent, but after a little searching I found the trailhead and started my adventure. The first quarter-mile of the Pump Station Trail was fairly nondescript, passing through a forest of oak, pine, and maple in every direction. To my left there was a steep embankment that led to the edge of a small creek, but otherwise there was no indication of what lay ahead. After traipsing along the trail for ten minutes or so, taking photos whenever the opportunity presented itself, I started getting the idea that the Pump Station Trail might be something remarkable. The first indication of this was a crumbling brick-and-mortar structure to my right that appeared out of nowhere. It was about ten feet tall and stood fifteen feet or so from the trail. I took a couple quick photos and continued on my way, soon finding a sign that warned of “dangers associated with falls.” I duly took note and proceeded with caution. The next indication of the remarkable nature of the Pump Station Trail shortly revealed itself. Following a side-trail that veered to the north, I saw the ruins of an old building–which I would later find out was the pump house for the dam–looming in front of me. The land rose on the left and descended to the right, allowing two clear entries to the decaying building. I took the left branch of the trail first and found myself gaping over the edge of a wall from a height of fifteen feet. There were weird and indecipherable mechanical structures inside it that simply begged for closer inspection, which led me to take a closer look. Backtracking from the high place where I found myself, I walked through the doorway to the pump house. The air was cool and musty, and there was the definite impression that this building had held a great deal of water at some point in the past. The bluish stone that made up the majority of the structure was quite beautiful in its own way and gave the place a faintly otherworldly mystique. The first weird mechanical structure in the pump house to catch my attention was a giant screw standing three feet out of the ground. I’m not an engineer, so I’m not in a position to say what this was, but it was quite fascinating and invited a host of questions about how the pump house worked when it was still in operation. The second weird mechanical structure to catch my attention was a very large pipe, a foot and a half in diameter, that stood not far from the giant screw. There was an accumulation of dirt, leaves, and other debris that clogged its mouth, but it was clear to see that at one point it had been a major conduit for the transfer of water from the dam. Coming out of the pump house, I caught a glimpse of it from another angle which gives a better idea of the size of the structure. The height is roughly fifteen feet and gives pause for thought when you realize that the part of the pump house that still survives is merely the foundation of the original structure. The building itself, which stood on top of what you see here, extended another ten or fifteen feet upwards to make for an imposing edifice. After inspecting the pump house, I continued to the east and found a series of connected chambers standing about eight feet tall which I would later find out formed the filter room, where the real action took place. To the best of my knowledge, this is where the water would have undergone coagulation, flocculation, and sedimentation. Through this series of interrelated processes, a chemical is introduced into the water which causes debris and organic matter to clump; the water is then allowed to stand for some length of time in order for the debris to form “flocs” or clumps; then a rake-like device is passed through the water to remove those clumps of debris. Presumably all of this would have taken place within the filter room pictured above, though there may have been differences in the process when the old dam was constructed in 1887. Around the filter room, there were rolling embankments of a clearly man-made origin, which enhanced the sense of otherworldly mystique that I had encountered in the pump house. The sunlight bursting through the branches of the surrounding forest provided the perfect accent to the scene, and it was easy to forget that this site had once been heavily mechanized and much more obtrusive to the surrounding forest. But nature has a way of reclaiming things when left to her own devices. Circling around the filter room and the pump house, I came back to where I had diverged from the Pump Station Trail. Following the trail again, I shortly came to a dry creekbed which extended to the south for some distance. I got the feeling there was something noteworthy in that direction, but I had no idea just how noteworthy it would be. Drawing closer to whatever it was as I continued to hike southward down the dry creekbed, I started to get the feeling I was entering a movie set for Lord of the Rings. Ahead of me I could see stone-and-mortar walls of a genuinely colossal scale, through which meandered the creekbed which had somehow regained the water which was missing earlier. Coming closer to the walls of what turned out to be an old and defunct dam, I started to feel as if I was merely an ant surveying the work of giants. These walls were absolutely immense, reaching skyward for a solid forty feet before cresting in a massive embankment that looked like a steep hill in the surrounding terrain. I stood and marveled at the sight for several minutes, taking photos from every possible angle and wondering for the life of me how people without computers and forklifts could ever have built such a thing. Deciding that I had to get a view from the top of the embankment, I progressed westward until I found a stretch of ground that wasn’t quite as steep and proceeded to climb it very gingerly. Upon reaching the top, I started following the clearly identifiable line of stone and mortar that ran eastward back toward the walls of the old dam. This was trickier than I expected due to the steep incline of the surrounding terrain, and I began to realize why there was a sign warning of “dangers associated with falls.” Coming as close to the edge of the forty-foot dropoff as I could, I decided that discretion was the better part of valor and headed back the way I came. Rejoining the Pump Station Trail, I resumed my hike in a westward direction and soon found myself in the middle of a lovely fern grove, which could easily have come out of The Hobbit. The sun in the distance illuminated the area with a calming radiance and helped to settle my spirits after the excitement of climbing to the edge of a sheer forty-foot dropoff. Following the full circuit of the Pump Station Trail, I covered another mile before finding myself back where I started. This was when I realized I hadn’t gotten a good photo of a fascinating structure near the dam which had caught my attention from the moment I saw it. Retracing my steps back to the walls of the old dam, I found what I was looking for: a stone tower of some sort that rose about twelve feet over the surrounding terrain. It was positioned in proximity to the walls of the old dam and seemed to have been built to overlook the spillway. Passing to the south of the tower, I found this very interesting crenellation in it. I still don’t know what purpose this tower served, but it seems to have been designed to stand in the middle of the surrounding reservoir and to allow access to the lower levels of the body of water. Perhaps it was a monitoring station or a well or a gigantic vent pipe for allowing air pressure to interact with a subterranean pipeline. Whatever it was, it was endlessly fascinating and gave much food for thought. Walking back to my car, I found myself reflecting on the beauty and scale of the ruins of the old dam. Beyond that, I found myself thinking how the reason for the construction of such an elaborate and awe-inspiring feat of engineering was something as simple as water. For it’s water that powers our way of life, whether we realize it or not. It’s water that provides nourishment, electricity, cleansing, irrigation, recreation, and beauty to all of our lives. It’s water that provides the basis for human society, without which none of us would be alive at this very moment. And it’s water that deserves our respect, our admiration, and our unceasing effort to protect it at all costs. “Eno River Park Map,” North Carolina State Parks, accessed Aug. 31st, 2017. “January — Pump Station,” Eno River Association, accessed Oct. 24th, 2017. Kueber, Gary, “Durham Water Company — Eno River Pumping Station,” Open Durham, accessed Oct. 24th, 2017. Schwantes, Jay P., “Pump Station Area,” Eno Trails, accessed Oct. 24th, 2017. “Water Treatment Process,” Durham, North Carolina, accessed Oct. 24th, 2017. A few weeks ago I went in search of a new hiking trail. I wasn’t intent on finding anything more than a few good views and a little peace of mind–the latter of which is increasingly hard to find in our culture of constant bombardment by advertising and social media. In the process, however, I found a forest of emerald green, a lady doing yoga in the middle of the Eno River, a great blue heron swooping through the foliage, an abandoned dam, an old graveyard, and a renewed appreciation for life which results whenever you immerse yourself in nature. It started when I arrived at Eno River State Park’s Cole Mill access on a Sunday in early August. There was a sizeable crowd–which I’ve come to expect from prior hikes on the weekend–but I nonetheless managed to get a parking spot and soon found myself at the trailhead for Pea Creek Trail, which leads to Dunnagan Trail after a mile or so. There were a few other hikers lollygagging by the river, enjoying the cool weather and peaceful scenery, but I soon left them behind. The trail was very narrow and somewhat steep as it followed the Eno River on the north bank, giving little room for maneuver. When a group of three guys in their early twenties crossed my path going in the opposite direction, there was barely enough room for us to pass without tackling each other, even though they were walking in single file. After passing the three guys, I then followed the trail beneath an underpass for Cole Mill Road, where an informal access point allows fishermen to park on the side of the road and avoid the occasionally overcrowded parking lot. After the underpass, the trail divided, with the left branch going uphill into the adjacent forest and the right branch hugging the north bank of the Eno River. I wanted to see as much of the river as possible, so I decided to take the right branch and soon found myself in a floodplain with ferns and tall grasses in abundance. It’s hard to believe how green a floodplain can be, but once you’ve seen that distinctive shade of emerald green you’ll realize how much of the rainbow is missing from our culture of concrete and plastic. In addition to the ferns and tall grasses, there were sycamores all along the bank of the Eno, jutting their roots into the river with the enthusiasm of children at a water park. Two sycamores in particular caught my attention. Their roots were configured in such a way that they were nearly conjoined at the base while allowing room at the top for someone to descend into them in a kind of giant cradle. Of course I had to check it out and promptly lowered myself down four feet of steep riverbank to do so, but unfortunately I was only able to get a decent photo of one side due to the extremely awkward angle and close quarters. Climbing out of the cradle of sycamore roots, I continued on Pea Creek Trail. After a short distance, I reached a footbridge crossing a small tributary of the Eno. The bridge was very basic in construction but had no difficulty bearing my weight as I passed over its beams to the east side and found what had brought me to Eno River State Park in the first place, namely Dunnagan Trail. There wasn’t much difference between Pea Creek Trail and Dunnagan Trail, but it was plain to see from the minimal level of maintenance and the occasional overgrowth of surrounding vegetation that the area didn’t get much foot traffic. None of this deterred one woman, whom I saw in the middle of the Eno River on a stretch of exposed river rocks, from doing yoga without a care in the world. I thought about photographing her from a distance through the foliage, but there were too many intervening branches to get a decent photo, and I didn’t want to I intrude on her communion with nature. Heading on once again, I stopped in my tracks when I heard the distant call of an approaching bird. I recognized the call as soon as I heard it and was delighted when I saw a great blue heron swoop through the undergrowth down the middle of the river, showing his distinctive plumage and giving the park a tinge of the wild despite its close proximity to downtown Durham, North Carolina. Before long Dunnagan Trail reached a point where a stone outcropping intervened, requiring a bit of climbing to surmount it. When I reached the top of the outcropping, I looked south across the Eno River to see a brick and mortar structure that looked like nothing so much as the remains of a dam. I didn’t realize it at the time, but I found out in my research for this article that this was one part of the old pump station, which was built in 1886-1887, and supplied water to the city of Durham, North Carolina, until 1916, when another dam was built on the Flat River to provide the city’s water instead. Regardless of the history, the ruins were quite imposing and provided a nice photographic opportunity. 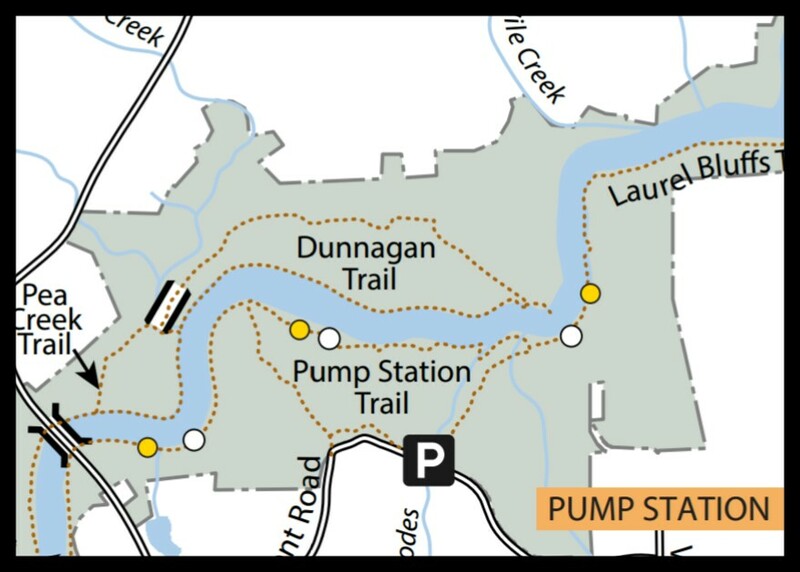 After passing the remains of the old pump station dam, I continued on my eastward hike, eagerly anticipating Dunnagan Trail’s sharp turn to the northwest. It took a while, but the turnaround came, and when it did I decided to pause for reflection before the Eno River disappeared completely from view. After a few moments, I headed northwest on the return leg of Dunnagan Trail as it climbed a considerable bluff toward the most unexpected part of my hike. After cresting the bluff–which rose from the Eno River over a distance of a quarter mile–there was a fork in the trail. One branch extended to the north, outside of the official limits of Eno River State Park; the other branch extended to the west, back toward the parking lot where my car was waiting to carry me home. Despite the allure of the northward trail, I took the westward trail and soon found ample reward for my choice. After passing through a valley and cresting another hill, I saw a pile of stones to my right which looked decidedly out of place. They seemed to be assembled in a pile by design and were sufficient in number to stand roughly five feet tall. I wasn’t aware of it at the time, but these were the foundation stones for the family house of the woman after whom the Dunnagan Trail was named, Catharine Link Dunnagan. Progressing a little further I was startled to find that there was another landmark associated with Catharine Dunnagan, specifically her grave. It was off to the left of the trail and clearly visible to any passing hiker, veritably begging to be inspected. Despite my reservations about approaching a grave in a forest rapidly dimming with the lateness of the hour, I decided to swallow my apprehension and get closer. With as much respect as I could muster, I stepped across the stone ring that surrounded the graveyard and took a good look at the headstone of Catharine Link Dunnagan, who died in 1914 at eighty-five years of age and was buried in the spot where I was now standing over a century later. It’s hard to say what you’re supposed to feel when looking at the final resting place of someone you never knew who died long before you were born and gave her name to the land where you’re now standing. On the one hand I was apprehensive about being so close to a place of the dead, even if I’m not inclined to believe that the dead are malevolent toward the living. On the other hand I was deeply honored to be able to see a place that must have been profoundly meaningful to the woman who chose it for her burial site. Wrestling with both feelings, I decided it was time to continue on the return leg of Dunnagan Trail. Walking through the serene forest of oak and pine, I was able to able to reconcile my internal conflict, leaving behind my previous apprehension and carrying in its place an appreciation for the way in which the dead imbue the land with sacred significance. For every piece of land is the final resting place of someone, whether human or animal or plant, who lived and died and gave her flesh back to the soil for future generations to cherish in turn. It is this return to the soil which binds the loved ones of the deceased to the land and which reminds us of the brevity and sweetness of every life, even the life of a complete stranger. Kueber, Gary, “Durham Water Company — Eno River Pumping Station,” Open Durham, accessed Aug. 23rd, 2017. Schwantes, Jay P., “Pump Station Area,” Eno Trails, accessed Aug. 23rd, 2017. Southern, Dave and Denny O’Neal, “Catharine Link Dunnagan,” Eno River Association, accessed Aug. 23rd, 2017. When I think of quarries, I generally think of big holes in the ground with levels upon levels of excavation that are devoid of life and inhospitable to anyone with an ounce of sense. What I don’t think of is a swimming hole in the middle of a state park that, despite two deaths in the past ten years, has nonetheless become one of the most popular summer hangouts in the area. Now that I’ve visited the Eno River Rock Quarry in Durham, North Carolina, I’ve begun to think of quarries in terms which highlight the simultaneous beauty and lethality surrounding so many of our culture’s byproducts. 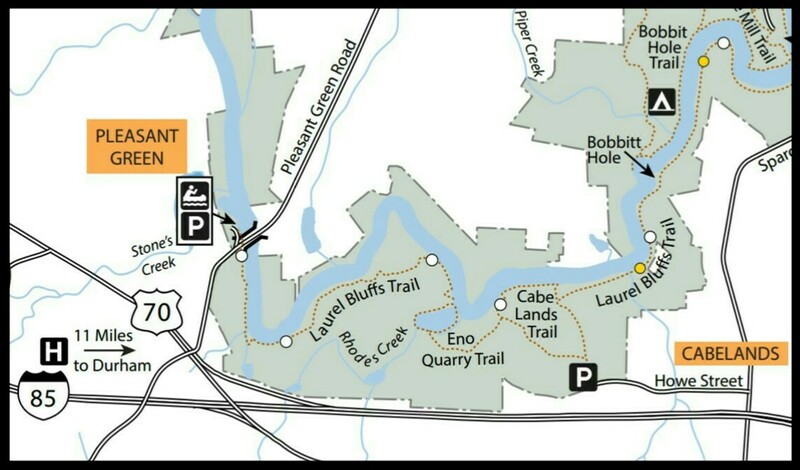 When I arrived a few weeks ago at the parking lot for the Cabelands access at Eno River State Park–which leads to the quarry–I got my first clue that this was going to be a memorable experience. Unlike most other parking lots at state parks in my area of central North Carolina, this one was full to bursting. There was literally nowhere to park at all; a sign at the entrance even proclaimed the fact. Turning my car around in frustration and muttering a few choice words, I was ready to leave in a huff. However the park ranger on duty noticed my reaction and called out to me. I had my windows open and responded, half-expecting to be told to move out of the way. Instead he told me there was room to park now since a few cars had just left. Pleasantly surprised at my turn of luck, I found a spot and started my hike on Laurel Bluffs Trail. Through the first mile of trails leading to the quarry, there wasn’t much scenery apart from a forest of oak and pine. A black snake crossed my path, but I didn’t have my camera ready and wasn’t able to get a shot before he disappeared to my right. Otherwise there was little wildlife apart from the other groups of hikers, mostly composed of students from Duke University and neighboring colleges, who had decided to make a day of it. After twenty minutes of solid hiking, I was beginning to think the quarry was little more than a rumor and a myth. Then I saw the first sign: a creek bisected the trail and had to be forded before I could reach the other side. Crossing the creek, I crested a small hill and got my first glimpse of the quarry itself. Of course I’d seen pictures of the swimming hole on Instagram, since some of my followers live in the Durham area and go hiking nearby. The quarry was nonetheless much different than I expected, looking for all the world like nothing more than a peaceful lake in the middle of a state park, the handiwork of nature and wilderness. Yet I was aware that it had been a working rock quarry at one time, and from the signs around the site I could see that it was much deeper than a traditional lake, with no shoreline to speak of but instead an immediate sixty-foot dropoff from the surrounding land to the lake bottom. Still, all looked pleasant and peaceful on the surface. After passing the quarry, I knew I wanted to explore further north and west along Laurel Bluffs Trail. I’d never hiked this section of Eno River State Park, so the allure of unexplored terrain was too much to resist. Continuing on the same trail past the northeast corner of the quarry, I noticed several piles of very large and imposing rock, which were part of the legacy of the old quarry from what I could tell. These rock piles were adjacent to the Eno River and bordered the floodplain, where the trail now led. On the opposite edge of the floodplain, the land crested in front of me. I wasn’t sure what to expect, but the rows upon rows of pine trees that spread out in front of me were a definite change in scenery. Their appearance was uncanny primarily because of their grid-like layout, as if someone had planted all of these trees at once and laid them out just so as to be ideally spaced for a future harvest. On that basis I would guess the area is a pine plantation, which will probably be chopped down in whole or in part at some point in the not too distant future. After passing the ostensible pine plantation–which was the first section of Laurel Bluff itself–I reached a grove of laurels which encroached the trail on all sides, leaving barely enough room for two people to walk side by side. Presumably these were the laurels that had lent their name to the trail. To my surprise they reached a height of seven feet or so, thereby obscuring my sight and lending the impression that I was passing through some kind of vegetative labyrinth. At last the laurels began to clear, and the forest regained her spaciousness, revealing a small gorge where a creek crossed the path of the trail. The bridge which crossed the creek at this point was very charming and provided the perfect opportunity to take a brief rest, which was much-needed at this point. Continuing past the bridge and another small creek, I reached the last portion of Laurel Bluff. There wasn’t much to see in this section of woods, but the gurgling of the Eno to the north was a calming and familiar presence that kept my feet moving. At last I came out of the forest and was greeted by shoulder-high blackberry bushes and mixed vegetation, accompanied by the dull roar of traffic not far in the distance. The brightness of my surroundings was a mild shock after the pleasantly diffuse light of the forest, but it matched the tenor of the sonic onslaught. Before long the trail passed under an overpass and led to the the Pleasant Green Access, where the trail ended. Turning around, I retraced my steps over the mile and a half that had originally led me away from the quarry, all the while passing people in bathing suits with flotation devices who were making their exodus. At last I rounded a corner and saw the quarry again, now with the light of late afternoon bathing it in a golden glow. It seemed as if nothing bad could ever happen in such a place. And yet–as I was to find out in my research for this article–there have been two deaths in the past ten years at the quarry. One took place in 2008 and the other in 2015. In the first instance, Ian Creath, an eighteen-year-old from a nearby university, drowned after attempting to retrieve a raft which had floated forty or fifty yards from shore. In the second instance, Lamont Burt, Jr., a seventeen-year-old who was planning to attend college in the fall of that year, drowned after jumping from the unofficial diving hotspot on the north shore of the quarry. Of course, the reason for these drownings goes back to the origin of the quarry. Between 1960 and 1964, Interstate 85 was being constructed not far away. Because there was a need for gravel due to the ongoing construction, a site was chosen where a sixty-foot pit with precipitous dropoffs could be sunk into the ground to gain access to all that gravel. When construction of I-85 ended in 1964, there was presumably no clear idea of how to make the site safe again, so state officials decided on the course of action which created the Eno River Rock Quarry: they flooded the sixty-foot pit with water from the adjacent Eno River and let nature take over from there. In the end, however, it’s not nature that’s to blame for the drownings which have happened here. It’s the culture of industrialism, which views nature as nothing more than a resource to be plundered and looted at will and which fueled the construction of I-85 so many years ago. Unfortunately that culture is still alive and well today, chomping at the bit for any and every opportunity to turn nature into a graveyard and the world into a concrete slaughterhouse. And that’s all the more reason for each of us to fight like hell to preserve every bit of the natural world that we can. If we don’t, it may not be long before there’s nothing left of our world but a graveyard for our own, and every other, species. “Eno Rock Quarry,” Local Wiki, accessed June 22nd, 2017. Sweat, Candace, “Despite dangers, swimmers flock to Eno River Rock Quarry,” WRAL, accessed June 22nd, 2017. Vuncannon, Douglas, “What lies beneath,” Indy Week, accessed June 22nd, 2017. Sometimes the road less traveled leads to a genuinely breathtaking surprise. I was reminded of this in April when I went hiking at Occoneechee Mountain, which — if you haven’t figured out by now — is my favorite hiking destination in central North Carolina. I’ve been going there on a monthly basis since the summer of 2015, so there’ve been plenty of opportunities for me to discover the hidden nooks and crannies within its limits. Yet somehow I managed to miss the most breathtaking sight of all in the course of the past twenty-two months. In my defense there’s a good reason for this. The hidden cove I discovered isn’t adjacent to any of the official trails; you actually have to venture off the main trail in order to find it. It’s not terribly far from the main trail, but it’s far enough that the spot is entirely occluded by the surrounding terrain. I found this out when I reached the fern grove on the north side of the mountain. I was headed up the staircase that leads toward the quarry when I saw a path veering toward the west. I’d seen it before but had never paid much attention to it. For some reason on this occasion I decided to follow it and see where it led. There wasn’t much to see at first. The westward trail ran along the edge of an embankment where the land sloped steeply upward to my left and downward to my right. Because the trail was unofficial and therefore not maintained by park officials, the vegetation was thick and gave me more than my fair share of smacks and slaps. Though the distance I covered wasn’t more than a tenth of a mile, I was seriously considering turning back due to the discomfort. Yet something nudged me onward subconsciously, and I found myself wondering if my regret would be greater from finishing what I started or turning back too soon. So I continued through the vegetation and kept my fingers crossed. Then I noticed a rock formation to my right. It was probably ten feet wide by fifteen feet tall, though it was covered by vegetation and dead leaves which obscured its features. I didn’t think much of it until I passed it and noticed the trail in front of me veering sharply to the left. I wasn’t sure what to expect, but my fingers were still crossed for something miraculous. Possibly for the first time in my life my expectation was surpassed with flying colors. Rising forty feet high to my immediate left and jutting outward over my position was the most breathtaking rock formation I’ve ever seen at Occoneechee Mountain. I’m not very small, being six feet tall and in good physical shape, but I suddenly felt as tiny as an ant at a gathering of elephants. The promontory — which I’ve decided to call Sentinel Rock in the absence of an official title — was jagged and rough-hewn, which may have indicated that it sheared away at some point in the not too distant past. This added concern to my amazement, but I quickly disregarded it as I stepped into the hidden cove which looked as if it came out of a fairy tale. To the right of Sentinel Rock was a gorge which had been hollowed out by a tiny stream gurgling gently over the surface of the rock. I can’t be certain, but it appeared that the stream originated at this very location. It’s strange to say, but this may have been the first time in my life that I’ve actually seen the birthplace of a stream. Above and to the left of the stream was something else very curious. About thirty feet from the outermost edge of Sentinel Rock was a strange opening in the side of the rock face that almost looked as if it could’ve been the mouth of a cave. Now I was really excited. Apart from a cave in the Appalachian Mountains which I visited a very long time ago when I was a kid, I’ve never seen the mouth of a cave before. I’ve certainly never stumbled upon one inadvertently. After very carefully picking my way up ten feet of steep moss-covered rock to make a closer inspection of the opening, I came to the conclusion that it was instead a sizeable crack which had been hollowed out by erosion and came to form a pocket in the side of Sentinel Rock. Regardless of its depth or adjacency to a cave, it was still fascinating and gave me the opportunity to more closely examine the area. After I’d finished my cursory inspection of the crack in the rock, I decided it was time to head back to the main trail. Very suddenly and for no apparent reason, I found it difficult to breathe. Possibly from a combination of excess pollen, inadequate ventilation in the enclosed microclimate, and physical exertion from climbing the slippery rock face, I experienced an asthma attack — which for me is virtually unprecedented. For forty-five seconds I could barely take more than a shallow gasp of breath. Combined with the fact that I was attempting to descend a slippery rock face with abundant moss that gave little protection in the event of a fall, I was momentarily flummoxed. Frost, Robert, “The Road Not Taken” from Mountain Interval (New York City, NY, USA: Henry Holt and Company, 1920), accessed May 4th, 2017. “List of Rock Formations,” Wikipedia, accessed April 18th, 2017.